Today was “Melt-Out” day at the Mt. Hood SNOTEL site at 5,400′ in the lower part of the Timberline Ski Area. That’s the spot where the media goes once each month from late December to late March to check out the snowpack. 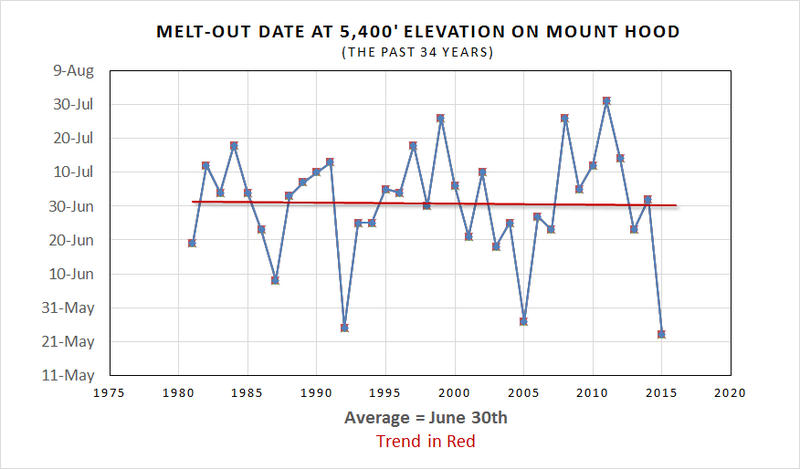 Have you ever wondered how long it takes all the snow in the Cascades to melt? Of course it depends on the elevation, with higher elevations (cooler temps) taking longer. The snow depth sensor shows 4″ on the ground, although that is an imperfect measurement since it’s measured from many feet above via sound waves…or something along those lines. The Snow Water Equivalent (SWE) measurement is more reliable. It is a “snow pillow” that measures snow water equivalent by sensing weight on a fluid-filled bag. Today that measurement dropped below 2″. It’s 1.60″ right now and was 3.40″ 24 hours ago so it should be gone tomorrow. Here is a chart showing the LAST DATE EACH SPRING/SUMMER that the SWE went below 2″. Data at this location at 5,400′ goes back to 1981. You can see the earliest WAS the drought year 1992 when the snow disappeared by May 25th. But the earliest is now May 22, 2015. The latest was just three years ago in 2011, when the last of the snow disappeared in late July. Now the data period is quite short; only 34 years, so don’t try to draw any earth-shattering conclusions, but the trend is now pretty much flat for the past third of a century. 1. At the 5,400′ elevation on Mt. Hood, the snow is not melting any earlier than in previous decades. 2. The Cascade snowpack AT THAT ELEVATION and IN THAT LOCATION is sure not disappearing! 3. This was a terrible snow year and we sure don’t want to see that repeated! This entry was posted on Friday, May 22nd, 2015 at 11:08 pm and is filed under Weather. You can follow any responses to this entry through the RSS 2.0 feed. Both comments and pings are currently closed. Some photos from my trip to Arches and Canyonlands. All I see Is a . “White Page”? Beautiful photos, Tyler. Reminds me of a similar road trip I took through the Desert Southwest thirty years ago: Valley of Fire, Cathedral Gorge, Zion, Bryce, Grand Canyon, Monument Valley, Arches. Amazing colors & geology. Thanks for sharing these! Yesterday (May 25th) was our”dark day” here with drizzle in the morning. Temperatures were cool before noon (about 55F at 11am)but we only picked up a trace amount. May 2015 is going to be my driest May on record. 72 and mostly sunny late this afternoon in Salem. A beautiful way to close out the memorial day weekend. Now on to Summer. Peace. I jsut wish we could get some nice weather for a change. Looks like ElNino is going to create an interesting growing season. On the other topic, I can not believe the massive Ice chunks that broken off in the Antarctic. It is amazing just how fast things are changing. On the good news, Texas is out of drought on the bad side of the news, people losing homes. I have a feeling that there will be more surprises coming. Rising seas? That can ONLY occur with an influx of water from land. Water actually expands as it freezes. Any iceberg or chunk form an ice shelf melting won’t do anything. Here is a little fact, The Ice shelves provides resistance on the glaciers, what happens when said resistance is non existent? Laws of gravity take over speed increases dumping more water in to the seas. Even Mr Nelson Knows that. LOS ANGELES (Reuters) – The last intact section of one of Antarctica’s mammoth ice shelves is weakening fast and will likely disintegrate completely in the next few years, contributing further to rising sea levels, according to a NASA study released on Thursday. And I have been personally watching them get smaller. We can argue this t’ll the cows come home, but when New Orleans is under water and those fancy pumps of theirs are unable to keep up, or when Places like Florida have people moving Northward, then said argument will be mute. Then we will debating on How long it will last or perhaps be debating on global cooling that is to follow as they begin to try and slow things down making things only worse instead of allowing earth to self correct. I hope the seas rise then I could surf in my backyard. But, the seas aren’t gonna rise. Muxpux – incorrect. While not at the same rate obviously as icebergs on land, fresh water (ice) is less dense than sea water, meaning it displaces. Boring: Seas are already rising. Certainly not at catastrophic rates but still. Argue what you will over whether or not this is human caused – but the data is clear. Boring – You can’t cite an opinion article with one professor in a science debate. That article is written by the same guy who says 2nd hand smoking doesn’t harm anything and that asbestos is fine. Do like…just a little research. Garron – put salt water (like the ocean) in the experiment and use a freshwater ice cube vs a fresh water glass. Physics lesson over. How can this even be up for debate? This should be easy stuff…. Sure I can Dringus, there are some good points in there and, who’s to say the sources you have aren’t bias like CNN? Because mine actually have sources. They show studies. They aren’t just some ex-professor saying stuff without citing ANYTHING to back it up. They aren’t written by people with other ideas that have been continually been smashed by science (2nd hand smoke, asbestos, etc.) and they aren’t IN AN OPINION SECTION IN A NEWSPAPER. They cite the observational data done by the highest tech equipment that can be used for measuring, and publish it for all to see. How can you not see a clear difference here? The temperature has been steady with a drizzle, it’s like we’re in a greenhouse. The plants and lawn are loving it. true some plants are, but pumpkins need more lol. Can’t wait for those 80’s. I’d take this weather all summer. It’s almost June and it hasn’t even been above 90 once here yet. That hot weather can stay in the desert where it belongs. On July 4, 2011 I hiked to the top of Table Rock SE of Molalla. At 4800′ there were still several feet of snow in the shaded areas. This year I was able to easily hike to the top in March with just a few inches of snow that had dusted the top half of the mountain the night before. 2011 had an incredibly cold damp spring and tons of marine layer that summer. September had some major heatwaves though if I recall. Perhaps in contrast fall will arrive early this year. With a significant Nino developing the coolest weather of next winter will likely be before New Years. I wouldn’t be surprised to see this winter bring a lot of mild and wet SW flow to the PNW. Could be another warm one. The good news for snow lovers and skiers is that my money is on a Nina returning in 2016-17. I don’t know what everyone else thinks but in my experience that was one of the longest east to west overall pattern I can remember. Most rain I’ve ever seen in Redmond over the last three days. Lots of urban flooding around town. Maybe it’ll keep the morels popping in the mtns! Yuck, woke up today feeling icky. A cup of coffee is in order for this North Westerner. Only good news about this weather is my allergies have subsided. So no cloudy love (lol!) from this local! This is great coffee weather. I don’t mind it since its not really cold. You can still sit outside under the porch cover and enjoy the fresh air. It isn’t hot so I won’t complain. Or in a temperate rain forest! It’s makeup time here in the foothills isn’t it? Day after day or waking up to drizzle. Those sunny days in January, February, and March were nice though. Looking at the graph, it seems to me that there is a wider swing between the years for the dates now than in earlier decades. That’s the only conclusion I can come up with. I have been around for 45 years. Yes, I understand glaciers are disappearing at fast rate. I understand snow packs are dwindling. I also understand that the Earth is always changing , nothing is constant. Maybe it is time for the human race to accept these changes. We can not reverse it. Sure we can go and do stuff to our sky, but it is vein plus the fact you killing my foods not in a “green house”. So instead of killing people’s gardens, why not let the earth do what it does best? Allow it to change and self correct. We humans are a foolish being if we think that what we are doing is helping. So let’s stop fearing change and accept it. Things are what they are for a reason. I for one look forward to a warmer temperature. Better for growing foods, and who knows. If i can grow a banana tree here in the nw..that would be great lol. We also have green houses and indoor products that will allow for growing many types of fruits and vegetables. Maybe it’s time we stop complaining and start doing something that is bennificial for our race. Stop spraying the sky, turn over to greener technologies, and just relax..it’s not like the earth is going to stop spinning on it n axis anytime soon. And if the snow pack is gone earlier, then maybe people need to.start conserving now. Maybe Portland needs compensate now. Maybe it is time that we as humans just stop interfering. The volcanoes that are erupting are certainly causing earth to compensate nicely. And if you want to focus on doom and gloom….Focus on YVO. I am sure that humans can get thier fears and nightmares from focusing on YVO. I mean after all..When Yellowstone pops it’s cork…weather will have become the opposite. So just remember, things can cause changes significantly with regards to weather on this place we call Earth. Oh..did you know that there are 2 magma plumes under YVO..and.if the surface temperature got hot enough to melt asphalt? So in my opinion, I am not going to be paranoid about warming climate. Do I drive a Hybrid. .yup, why do I drive a hybrid? You covered quite a bit of ground there. You could read that Mark? Well your a better man than me lol. I’m just going to be honest with you lee…I don’t understand your opinion. Do you want cancer with that battery? Recently, the Environmental Protection Agency and the U.S. Department of Energy undertook a study to look at the environmental impact of lithium-ion batteries for EVs. The study showed that batteries that use cathodes with nickel and cobalt, as well as solvent-based electrode processing, have the highest potential for environmental impacts, including resource depletion, global warming, ecological toxicity, and human health. The largest contributing processes include those associated with the production, processing, and use of cobalt and nickel metal compounds, which may cause adverse respiratory, pulmonary, and neurological effects in those exposed. Tesla Model S base. Photo: Wikimedia Commons. In other words, li-ion batteries that contain nickel and cobalt have a significant effect on health and the environment. More specifically, this includes Panasonic’s automotive grade li-ion batteries, which contain lithium, nickel, cobalt , and aluminum, and a proprietary cathode geometry developed jointly by Panasonic and Tesla — and are currently used in the Model S.
I remember darker days than yesterday. .May 18th 1980.hqs them all beat. I think the marine layer + upper-level clouds have made it extra gloomy the past few days. At least now that we’ll lose the higher level stuff it might be a brighter gloom? It was indeed a brighter gloom today.